BSNLEU welcomes the decision of Congress President, Rahul Gandhi, that, "Niti Aayog would be scrapped". Congress Party President, Rahul Gandhi, announced yesterday that, he would scrap the Niti Aayog and would bring back the Planning Commission. After independence, the Planning Commission was created in 1950, for developing the economy of the country in a planned manner. However, after coming to power in 2014, Prime Minister, Naredra Modi, abolished the Planning Commission and created the Niti Aayog. After it’s creation, the Niti Aayog has been entrusted with the one point programme of dismantling the Indian Public Sector. It is very important to recollect that, the Niti Aayog had already recommended the closing down of BSNL and MTNL. Further, the Niti Aayog had also rejected allotment of 4G spectrum to BSNL. The Niti Aayog had asked, what is the use is allotting 4G spectrum to BSNL when all the private telecom companies are already providing 4G service? The Niti Aayog is 100% anti-public sector and pro-corporate. Under these circumstances, BSNLEU welcomes the announcement of Congress President Rahul Gandhi that, Niti Aayog would be scrapped and the Planning Commission would be brought back, if Congress Party comes to power. Only Reliance Jio and BSNL have added new customers in February, 2019. According to the data released by the TRAI, only Reliance Jio and BSNL have added new customers in February,2019. Vodafone Idea and Airtel have lost their customers. Reliance Jio has added 77.93 lakh new customers in February, 2019. BSNL has added 8.99 lakh new customers during this period. Vodafone Idea has lost 57.87 lakh customers. Airtel has lost 49,896 customers. BSNL has improved download speeds, but no where close to private telecom companies. As per the study conducted by mobile analytics firm, BSNL has improved it’s download speed by nearly 7% in the past 6 months, according to the study conducted by open signal, between 1st December, 2018 and 28th February, 2019. However, it is no where close to it’s competitors, Airtel, Reliance Jio and Vodafone Idea. According to the study, Bharti Airtel, has the fastest mobile network, followed by Reliance Jio. Vodafone Idea comes third. BSNL to lease out it's optic fibre network. It is reportedly told to the media, by Shri Anupam Shrivastava, CMD BSNL, that, BSNL is contemplating to lease out it’s huge optic fibre network to generate extra revenue. According to media reports, BSNL is having 7.5 lakh route kilometres of optic fibre. Reliance Jio comes next with it’s 3.2 lakh route kilometres of optic fibre. (This includes 1.78 lakh route kilometres of OFC acquired from Anil Ambani’s Reliance Communication). Airtel comes 3rd with 2.5 lakh route kilometres of OFC and Vodafone Idea comes 4th with 1.60 route kilometres of OFC. Jet Airways closed down it's services. After running it’s services for 25 years, Jet Airways closed down it’s operations last night. The last flight took off at 22:30 hrs last night from Amritsar to Delhi via Mumbai. In a statement issued by the Jet Airways Management it is stated “with immediate effect we are compelled to cancel all our International and Domestic flights. The last flight will operate today.” It may be recollected that at one point of time, Jet airways operated 600 flights daily. This is the second airways to close down it’s services after the Vijay Mallya owned Kinghfisher. 5 million jobs lost between 2016 and 2018 - says a study of the Azim Premji University. Hindi translation of "5 million jobs lost between 2016 and 2018 - says a study of the Azim Premji University." अजीम प्रेमजी यूनिवर्सिटी द्वारा किए गए एक अध्ययन के अनुसार 2016 और 2018 के बीच 5 मिलियन नौकरियां खत्म हुई.. Notification issued for holding Redesignation Committee meeting. As already reported by the CHQ of BSNLEU, a meeting of the Redesignation Committee, will be held on 26-04-2019. The Restructuring Branch of the Corporate Office has issued the notification for the meeting today. Telecom tariffs to rise in the 2nd half of financial year 2019-20 - says Edelweiss. Prices of telecom services in India are likely to rise in the second half of the current financial year (2019-20), an Edelweiss report said today. The report says that the price hike is likely to take place due to the fact that, the penetration in mobile broadband services has increased significantly and is nearing a saturation point. This is a good news for BSNL. It may be recollected that due to the implementation of predatory pricing by Reliance Jio, BSNL's revenue collections fell drastically, and the Company went deeper into financial crisis. If tariffs increase, BSNL's financial condition will also improve. Hindi translation of "Telecom tariffs to rise in the 2nd half of financial year 2019-20 - says Edelweiss." Hindi translation of "India Post reports a loss of Rs 15,000 crore." Hindi translation of "BSNL narrows down loss to Rs 7,500 crore in Financial Year 2019." India Post reports a loss of Rs.15,000 crore. The Department of Posts, called as India Post, has reported a loss of Rs.15,000 crore for the financial year 2018-19. It's loss in 2015-16 was Rs.6,007 crore. BSNL narrows down loss to Rs 7,500 crore in Financial Year 2019. BSNL is likely to narrow down it's loss to Rs.7,500 crore in the financial year 2018-19. The Company had reported a loss of Rs 7,992 crore for the financial year 2017-18.This is told by the CMD BSNL to the ET Telecom. BSNL has added a record number of 91,000 enterprise customers in FY 2019 including business-to-business or B2B connections. This is more than a 50% growth over the last financial year. BSNL's loss was Rs. 4,793 crore in Financial year 2016-17. 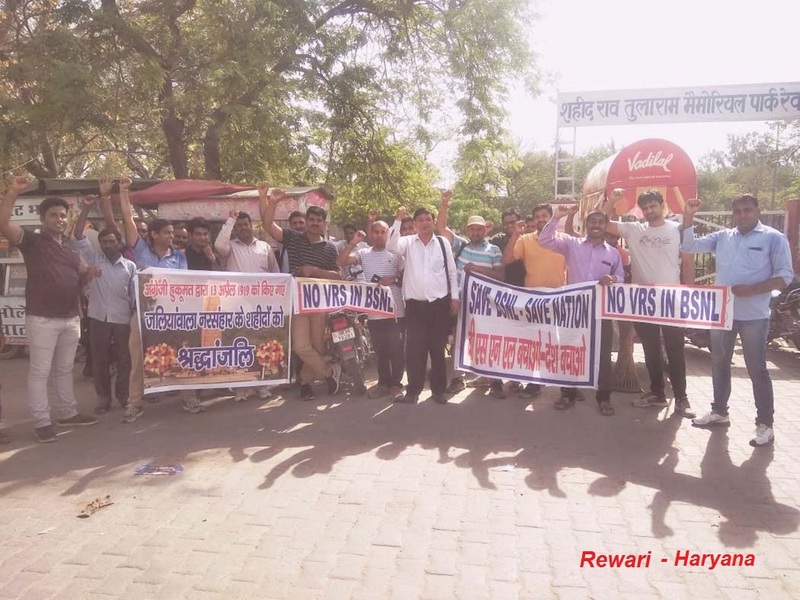 Hindi translation of - Intensify the " SAVE BSNL- SAVE NATION" campaign..
सभी सर्किल सेक्रेटरीज और CHQ ऑफिस बेयरर्स ये सुनिश्चित करें कि "बीएसएनएल बचाओ, देश बचाओ "
Intensify the "Save BSNL - Save Nation" campaign. All circle secretaries & CHQ office bearers are requested to ensure that the SAVE BSNL - SAVE NATION campaign is organised effectively, by way of conducting street corner meetings. The climate is very hot. Hence, the street corner meetings can be conducted during evening hours. Print as many handbills as possible and distribute among the public and employees. 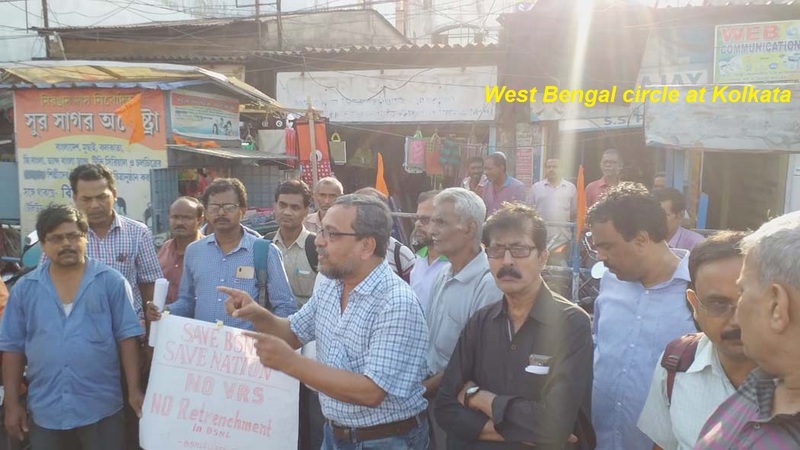 Try to conduct as many street corner meetings as possible, within the stipulated time,ie., 30th April, 2019. Please send report and photos to the CHQ. Regards. Save BSNL - Save Nation - Hindi matter for printing handbills. 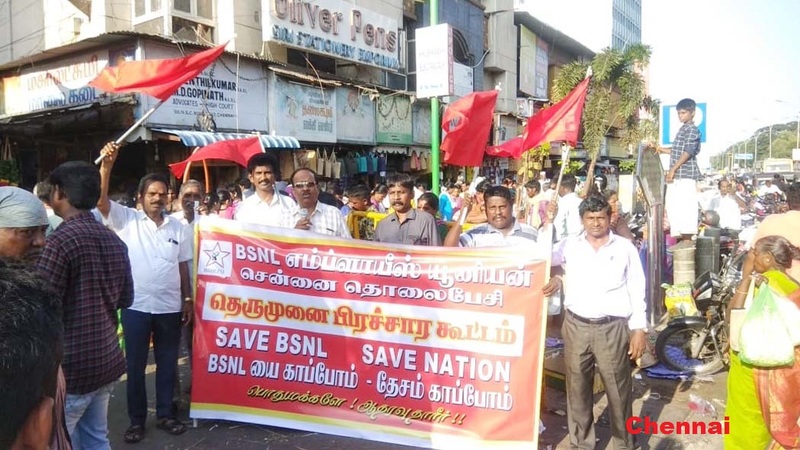 BSNLEU's "Save BSNL - Save Nation" movement started in right earnest.. The Ghaziabad CEC meeting decided that BSNLEU should organise a "Save BSNL - Save Nation" campaign, under it's own banner. 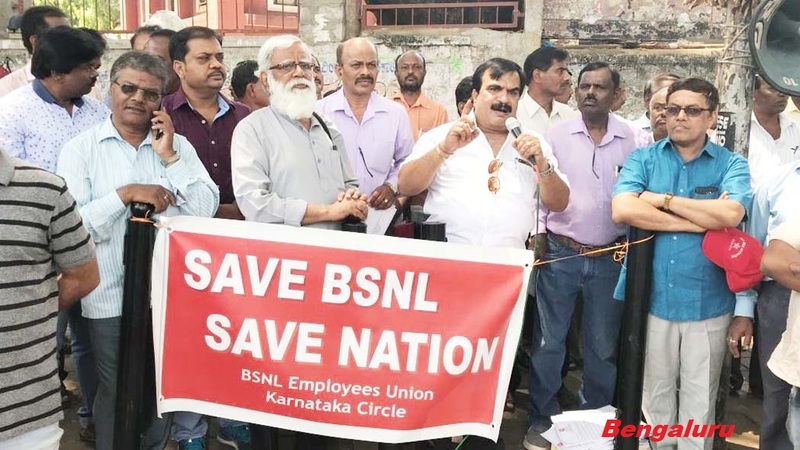 According to the decision, BSNLEU should organise street corner meetings throughout the country, meet the people, and explain how BSNL is being systematically weakened by the government, to benefit Reliance Jio. 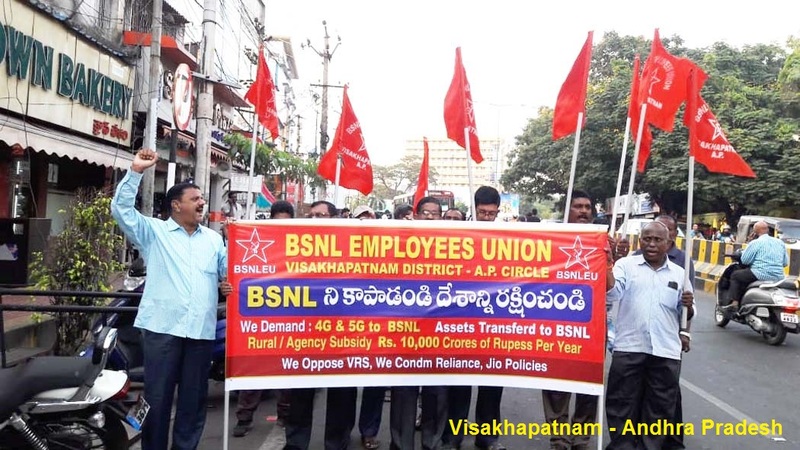 BSNLEU should also seek the support of the people for the revival of BSNL. The Ghaziabad CEC meeting also decided that this movement should start on 13th April, 2019, which is the Centenary of the Jallianwala Bhagh massacre. CHQ is glad to note that the" Save BSNL - Save Nation" movement has started in right earnest in many parts of the country. CHQ heartily thanks all those circle unions and calls upon the other circles also to immediately launch the movement with full vigour. "Save BSNL- Save nation" movement - Matter for handbill.. According to the decision taken in the Ghaziabad CEC meeting, BSNLEU has to independently conduct the "Save BSNL - Save Nation" campaign. During this campaign, handbills are to be distributed among the general public, explaining about the problems related to BSNL's revival. CHQ has prepared the matter for the handbill. This matter has to be translated into all the languages. They should be printed in thousands and should be distributed among the people. These handbills may be widely circulated among the employees also. CHQ will get it translated in Hindi also. 38th meeting of the National Council to be held on 29-04-2019. The 38th meeting of the National Council will be held on 29-04-2019. Notification for the meeting has already been issued. This meeting is being held at a short notice, since Ms.Sujata Ray, Director (HR), as well as the Chairperson of the National Council, is retiring on superannuation on 30-04-2019.